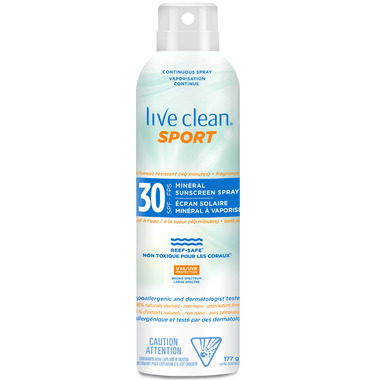 The Live Clean Sport Sunscreen Spray has a moisturizing Mineral formula with naturally derived Zinc Oxide. The active ingredients Zinc Oxide and Titanium Dioxide provide natural suncare protection. Hypoallergenic, dermatologist and pediatrician tested. Eco-friendly air-powered with no chemical propellants. 98% naturally derived, non-nano, petrolatum free, silicone free, non-greasy, non-whitening, and fast absorbing. Free of parabens, phthalates, fragrance and dyes. Directions. Spray, then spread liberally and evenly 15 minutes prior to sun exposure. Reapply at least every 2 hours. Reapply after 40 minutes of swimming or sweating and reapply immediately after towel drying. For use on children less than 6 months of age, consult a health care practitioner. Caution: For external use only. Do not use on damaged or broken skin. If rash occurs, discontinue use and consult a health care practitioner. When using this product, keep out of eyes. Rinse with water to remove. Keep out of reach of children. If swallowed, get medical help or contact a Poison Control Centre right away. Great clearance price for a winter vacation! I favour all Live Clean products. I love this sunscreen! The only reason I gave it 4 stars instead of 5 is because I find it quite greasy. It's a small complaint compared to everything else that is great about it: great price, easy application, natural sun protection without chemicals, no scent, blends well, very little white residue. Absolutely love this product. It sprays easily and blends into the skin well. It is not thick or greasy and does not leave white streaking. It also smells nice. I love that itâ€™s natural and wonâ€™t harm aquatic life. Both my son and I have never burnt when using it. I bought this product as I was going to be snorkeling in Mexico, and wanted a reef safe product. This was the only product I could find in my city, so I purchased it knowing I've loved everything else by Live Clean. Well, I was very disappointed. I applied as per directions, and I burned...I thought maybe it was just me. So my son used it yesterday at the beach and he is now burnt on his back, stomach and arms. He reapplied throughout the day and was not in the water for it to wash off (Atlantic is still too cold!). I do not recommend this sunblock at all, and am highly disappointed in it. This sunscreen is great! It sprays well and rubs in really evenly, which is perfect for fussy kiddies! I'm new to mineral sunscreens and this was my first purchase. The spray is great for coverage but it does come out a bit white. From what I have heard this is a common effect of mineral sunscreens so I'm not too surprised. Overall it's effective, doesn't have a strong smell, and is one of the more affordably priced mineral sunscreens. I would buy it again. I bought this because I use Live Clean hair care products and wanted a natural sunscreen product without chemical ingredients in a spray formula. I ordered two bottles because they were on sale but wish I'd only ordered one. It comes out thicker than typical spray products and is white so you have to rub it in after applying it. It also has a light but not great scent. I have some dry skin patches and the product dries white and settles on those patches even though I applied it sparingly. I think I'll be going back to Coppertone or Neutragena spray products just because the smell, consistency, and colour turn me off enough that I would be inclined to forgo applying any sunscreen which is obviously not ideal. Fantastic product! I haven't had very much luck with mineral sunscreens until I found this product. Either my skin would burn or it would be super sensitive and itchy with other products. I will definitely purchase this sunscreen again. It works great on my kids too. I love that it is a spray which I find much easier to apply.